WhyTheWorld.com - Five smooth stones, and a sling.WhyTheWorld.com | Five smooth stones, and a sling. Five smooth stones, and a sling. An interesting publication is starting to make waves online and in social circles with an intriguingly different approach to the evolution vs creation debate. It suggests that Darwinian evolution is on its way out and that we need to get back to teaching God in School. 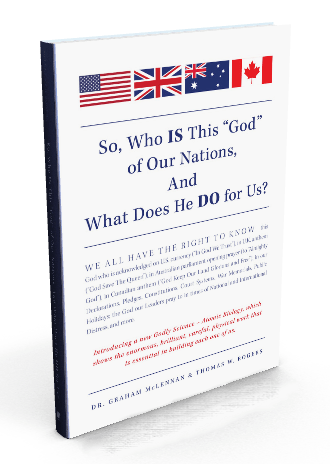 It is a book by Reality Research and Development Inc. titled, “So, Who IS This ‘GOD’ of Our Nations, And What Does He DO for Us?”. The premise of the book looks at 4 of the large Western nations that hold to a God of some sort that is recognized in their government foundation documents, in their monuments, history as well as legal institutions and yet is being ignored in history, science and any public school classes as if “He” was never there. These countries are Australia, Canada, the UK and USA. But its the second half of the book that goes into a whole different ballgame and a new angle on science that could gain some traction. The beginning of the book looks at the history of God in these 4 countries, and the second half of the book looks at a scientific reason why this God (who is not the church) is visibly and clearly scene right now every second of every day in a new science called Atomic Biology. Darwin’s “evolution” is INCAPABLE of building babies and us! It does not have the supernatural intelligence, dexterity, speed, reliability, or care to do the phenomenal physical work of building and sustaining our cells and us. It then goes on to list a growing pile of scientists and doctors that are choosing to dissent or disagree with Darwinian Evolution. Suggesting, that Atomic biology will bring a scientific reason to get God back into schools in History classes for the nations involved and in Science class. QED 3 Question Evolution Day Feb 12 – Darwin’s Tree of Life … Getting the Axe! 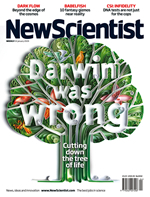 I thought it would be great to share a recent concession that Darwin was wrong in Britain’s secular science journal, the New Scientist. Infact, the entire Genome project is revealing predictions of the Creationist theory that show no evolution of DNA but rather similar and identical DNA in many creatures from sea sponges to humans as if a grand coder designed them and set their limits. This should not be the case if the Darwinian theory were true that molecules evolved over time from simple to more complex via advantageous mutations, adaptations, and natural selection. ‘Conventionally, sea squirts – also known as tunicates – are lumped together with frogs, humans and other vertebrates in the phylum Chordata, but the genes were sending mixed signals. Some genes did indeed cluster within the chordates, but others indicated that tunicates should be placed with sea urchins, which aren’t chordates. But today the project [to reconstruct the tree] lies in tatters, torn to pieces by an onslaught of negative evidence. Many biologists now argue that the tree concept is obsolete and needs to be discarded. “We have no evidence at all that the tree of life is a reality,” says [an evolutionary biologist from Marie Curie University in Paris, Eric] Bapteste. Creationists have shown and agreed that there is indeed adaptation within kinds that allow for great variations and a type of tree grows from each those kinds. ie. one dog ancestor on the Ark has branched out to become all the dogs on earth that we now see, but that these changes remain all within in their kind. There is no moving from a cat to a dog or a cow to a whale etc. thus it is not a single tree of molecules to man, but instead a crop of amazing kinds all appearing and adapting where need be as the creator coded them to do. So a big Happy Birthday to Darwin, we hope that soon our scientific communities as a whole will overturn your mistaken theory. I am sure that your own view from eternity is one of frustration. In not so many hours a debate that has been dubbed “Scopes 2” will begin at the Creation Museum in Kentucky. It airs at 7pm EST and will be broadcast via live feed at www.debatelive.org . The statements are of course meant as a backhanded ad hominem attack against those scientists who happen to concluded that our studies in every area of science more consistently align with an intelligent designer than with anything else. This combined with the whole philosophy behind the New Atheism* that Bill Nye appears to subscribe to, which has publicly stated that parents or teachers that teach creationism are abusing their kids has essentially stirred this debate in the first place. So the debate should be an interesting one and perhaps the most viewed in history or in a long time on the subject. My question is this…. what has happened to science that has caused this to be such a controversy? Science is meant to examine and follow the evidence wherever it may lead and thus good debate is extremely healthy for science. 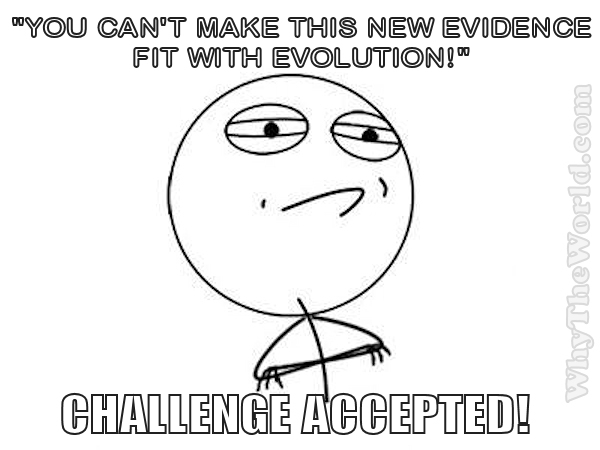 It seems that the opposing view to this type of discussion or debate simply do not want the controversial evolutionary science put to scrutiny. This is because it goes way beyond science to ideology and what has been labelled scientism. Scientism in its simplest definition is the belief that only methods of naturalistic science are the most authoritative worldview to the exclusion of all others. And when dogmatically applied it seeks to destroy potential threats to its existence. This has led to an elitist attitude in mainstream science that serves as a type of inquisition to extinguish the reputation of scientists who have a more “open” view. Thus denial of tenure, lawsuits, public maligning, blocking of papers in peer reviewed journals become the battle of vocal scientist that lean towards creation or intelligent design. Ben Steins docudrama “Expelled: No Intelligence Allowed” started a growing list of examples of this that has been ramping up in publications and videos since. The New Atheism movement led by the Four Horsemen as they have called themselves (Dawkins, Harris, Hitchens and Dennett) has unfortunately helped to push scientism into the rediculous and thus weaken actual science with an anti-God prime directive. To conclude then, this debate could be a very good thing for science, atleast that is my hope. But it could also turn into a dig-up-the-crap fest that plays out online with endless video rebuttles and snappy Twitter posts….. let me revise that … I believe it will turn into a mess like this without a doubt in the blogosphere where us armchair scientists come out to play and the more vehement opposers try to slaughter. You may or may not have heard, but Ben Stein the lawyer, writer, playwright, comedian has produced and launched a movie/documentary that is looking fantastic titled, “Expelled – No intelligence allowed.” The famous teacher from Ferris Bueller’s Day Off , has pulled out a whammy that will wake up the Western World to the reality of the evolutionary science white tower suppression against more valid creationist theories and facts. The truth of God’s creation cries out to us through every facet of nature and discovery, and yet those scientists, mathematicians, physicists, etc. that postulate and believe in devine creation and intelligent design are being pressured, suppressed, ridiculed, excluded and fired from places that give them a voice. It seems that any entrenched oligarchy that feels threatened by a more valid and evident theory reacts swiftly to protect its existence and funding. This has been going on since the so called “Scopes Monkey-trials” that preported to kill the idea of an intelligent Designer, and which was bolstered largely by the media. Now it seems that the tide has come full- circle! The suppression has been coming from the evolution-side since the 60’s and now a law-trained media-type who believes in God is using a movie medium to kick the goads the other way!! I for one am pumped, stoked, and so glad to see a little glimmer of light in what has been a dark time in science. It is time for the clay to stop telling the Potter He doesn’t exist! Finally! A Museum Worth Seeing… and protesting? I am so very excited to see that the AIG Creation Museum in Kentucky is finally open! 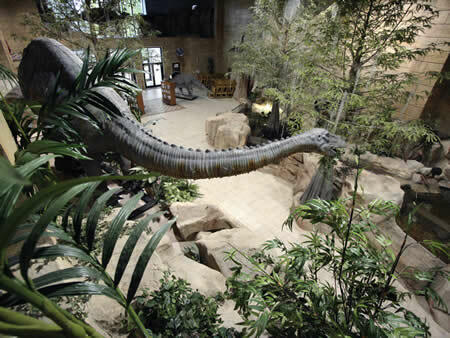 Here you can see the lobby with beautiful dinosaur animatronics, and stunning landscaping. The cost to build this museum seems large ($27 million) but hardly compares to the outrageous sums of money to build evolutionary monuments across the Western World. For example, the operating budget for the Houston Museum of National Science is over $20 million on a yearly basis, and that is just to operate it. I could not find the construction costs in the brief search I did. But when you add in the costs of all the museums, the public school curriculum, the movies and educational films, the High Definition tv shows, you know we are talking Trillions of dollars just to brain-wash the general populice that there is no God, and they evolved from nothing. And that doesn’t count the legal battles fighting any scientists who disagree with the evolutionary view and try to begin teaching it in public places. I can’t wait to visit the Kentucky Creation Museum someday soon and maybe chat with some of the protestors … yes, there are evolutionists that have actually been protesting the Creation Museum … it is absolutely pathetic to say the least. The doors of the Museum opened for the first time at 10am on May 28th, and a group of protestors were there to try and scare off the 4000 visitors that went through that day. Oh vay! Hopefully this video from YouTube will be online for awhile, but it gives an overview of the feelings behind the protest. The comment of Lawrence K. on the stage that real science comes without any presuppositions, and just lets nature talk is hilarious as the exact opposite happens in the evolution world, or the lady that claims that believing the Bible about what it says in Genesis is a “perversion” of Christianity is another laughable comment. And then there is the comment from Chuck Smalkowski that his real fear is that children are being brought in there and indoctrinated. Do these people have any clue what they are saying? Have they not considered the public science religion that is currently indoctrinating the children of our society to the exclusion of all other views. They actually want no other view but an evoltuionary view to be taught period without opposition. That underlying theme and bias is the exact reason why they are being unscientific in the highest. and why the Creation Museum must push on and grow. The Dark Ages were marked by a dead church with religious leaders calling the shots, reading the scriptures in an unknown language and interpreting them for the common people. All power was held in the hands of corrupt leadership, and God was far from it. Today’s science is much the same, those guys in the white coats use big words and convoluted theory and interpret it to the masses while collecting large doles of public money and shutting out the naysayers, and God is also far from it. The problem is God does exist, and He did create the world, He even told us exactly how He did it, all creation testifies to it, and He will hold us accountable because of it. Real science allows for that and looks at God’s creation for what it is, designed magnificence from the DNA strand to the vast Universe. Jan 31, 2007 at 9am CST I start up my computer and can’t reach my gmail. my router, renew my IP… try going to other sites, they come up fine. What the? … lets try google.ca … nothing… lets try google.com …. NOTHING … panic sets in…. ok I will try Lycos, oh wait thats not working either, it uses google! ok …. think Derek …. oh! lets try yahoo … ahh good search results are appearing, but wait a minute, I can’t click on them. They use Google too, is this a terrorist attack? What is happening? Google, this is Google we’re talking about, it can’t go down, its servers must be redundant and all over the world. Its a staple of our society, a pillar on the internet I am even forced to use MSN search and it mentions nothing of the outage. Is this a new type of terrorist attack to put the web-world into confusion? Ahh this day is starting out strange I must say. But praise be to the God Almighty who does not change like shifting shadows, but remains the same forever and amen. Infact, I am going to look-up some verses on God online here to see more about Him…. oh wait a minute… Google is down!!! ahhhh! One huge pet peeve of mine (to put it lightly) is the outright denial of the World-wide flood recorded in the book of Genesis in the Holy Bible. Everywhere I look, the evidence screams out that it happened from the polar ice caps, to the water recession lines on every continent, to the majority of the fossil record, to the oil and “natural resource” deposits, to the fish and clam fossils on mountain tops, to the Grand Canyon, to the countless fresh water lakes, to the mini grand canyon that formed in days at Mt. St. Helens. The vast majority of geological and geographical spectacles all point to one huge deluge that occurred at some point in the Earth’s history. But one of the most incredible witnesses to the flood, is the traditions and myth stories recorded and shared in civilizations all over the world throughout time since the time of the flood. Some of them bearing great resemblance to the Genesis story yet coming from cultures untouched by Hebrew influence. Similar to records of dragons and great monsterous creatures that man and tribes and heroic knights have fought, we have placed the flood stories into a meaningless mythology closet as if they were fairy tales. But what if they are not. What if, instead, they were recordings of actual events shared through verbal and written means to remember and record history. Some of the stories have been altered and changed through time, some lessened, and some magnified. Since the flood is a real historical event that resulted in 8 people being saved from a global disaster, you would expect that the descendants of those 8 individuals would have heard and shared this earth changing event as they began to spread out across the globe. And it is my point here today to say that they did. There is so much more that can be said here about the Tower of Babel and similarities of technology and archealogy from civilizations worlds apart that support this simple analysis and the Biblical record, but I digress for the time-being. There is a philisophy that states that “the medium is the message”. Well I believe that the world in itself proclaims the truth about God and testifies to the accuracy of His Word, His salvation, His story. The world, the creation is the message and testimony to us, and is our reference point for the reality of God the Creator. Stick that in your pipe and smoke it, …. no wait don’t, smoking’s bad! The Discovery Channels, National Geographic and others funded to debunk the Bible. I find it odd that it appears that the channels of the Discovery Channel network, and the National Geographic channel seem to have a purpose to try and debunk the Bible, and Jesus. This is merely a hypothesis based on repeatedly seeing shows on those channels that completely try and refute what the Bible says. From Noah’s Ark to the Resurrection and life of Jesus, to the Rapture. And every one of these programs give inaccurate accounts of what the Bible says, and then bring on some supposed “Expert” to state why the Bible and Bible-believing Christianity is so wrong in its understanding and teaching. And they always seem to get some liberal Theologan on there that basically talks down his nose to the audience as if he is a representative of the church who is there to correct those who actually believe the Word of God to be true. Who funds the Discovery Channel? They use very high quality production, HD quality, incredible graphics, animations, and footage. They spend big bucks to give the best show possible … and their whole purpose? To proclaim evolution and debunk the Bible as often and in as many ways as they can. Even when they try and balance the arguments by bringing on faith-filled, Bible-believing Christians of the real church today, they seem to edit them just enough to make them sound wrong. They end these shows by mixing in lots of doubt, and then ask the viewer to make their own decisions. And the sad fact is, these shows seem to come on at exactly the wrong time. For instance the one on the Resurrection and character of Jesus aired on Easter weekend when most God-fearing Christians were celebrating the death and resurrection of Jesus. Why did they air it then?!? If there is one thing I know, everybody has a bias, and a purpose. If you follow the money, your bound to find something behind the presentations. Evolutionary science is notorious for making their church, beliefs and sermons visually captivating all the while taking a tithe while you sit “learning” their mantra. They found it! A fish was discovered or atleast announced this week as being the missing-link between fish and land-based creatures. The article makes several startling statements from scientists involved in the find. The reason there was still a gap is because there were no “links” to be found. Did you know that? It is interesting that the incredible lack is never mentioned and is denied until a possible “missing-link” is found. Not too far down the road I predict again that this big discovery will turn out to have been stretched a bit. Already the spin on the actual fossil is clear. They are looking at a God-made creature’s incomplete fossil through Darwinian thick bottle glasses. These aren’t just rose-colored, more of a muddy brown actually and did I mention they are thick?!? All of that insight came from this.. 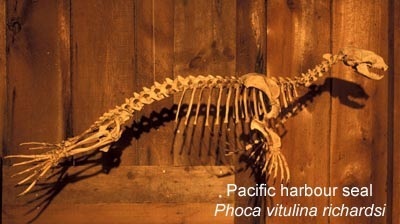 The creature was a fish — with scales, fins and gills — but it moved its head independently of its body, could drag itself along on land as today’s seals do, and may have walked, although the research team did not find fossil hindquarters to test that hypothesis. hmmm, they just found the upper half of the fish. Kinda reminds me of “Lucy” with the human knee joint found a mile away in different strata, or Nebraska man with the entire artistic rendition showing complete walking ape, with family and eating/hunting habits… the tooth that they created this fantasy out of was actually that of an extinct pig. Look, look at those feet, and fingers!